He has to lean forward over our table just to hear me speak above the din of the restaurant where we're having lunch. It was quite a bit worse the night before when Greg was playing alto saxophone with one of his jazz quintets at AS220's Black Box Theater in Providence. Because of his head cold, he was having trouble hearing the other musicians in the band, even though they were playing hard and loud. And the fact is, the most creative jazz is about how the musicians listen and respond to each other spontaneously. Of course, as a listener this night, you couldn't tell there was anything amiss. Greg sounded just as energetic and creative and in-tune with the other players as he has for decades. Early in his career, Ray Charles (yes, that Ray Charles) picked Greg Abate to play lead alto in his big band touring the world. "I was in Los Angeles," Greg recalls, "Living with friends. No work, no money, and I auditioned and suddenly I get this great gig with Ray Charles!" Admittedly Charles's rhythm and blues style was not exactly Greg's most favored type of music. After two years, Greg moved to the Arty Shaw band and his career continued to advance. Still in search of the small group jazz/bebop he most prized, Greg left the Shaw band and soon he was playing a variety of big band gigs, not just around the US, but world-wide. But the style of music he was playing still wasn't quite the classic "bebop" genre he'd embraced back in high school. Bravely, and with no safety net, Greg started booking himself gigs with quartets and quintets made up of musicians who shared his love for the Charlie Parker/Dizzy Gillespi jazz styles that, admittedly, appealed to a very small audience compared to rock and pop. Not too many jazz musicians can maintain an existence much less raise a family with two sons as Greg has done, without compromising to play more mainstream musical gigs. He has an agent, but he continues to do a lot of the booking himself. "It's a little easier now with E-mail," Greg says. "I used to just have to make tons of phone calls to club owners and concert venues until I found a gig." 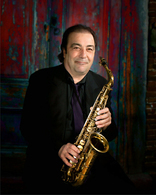 Already a master of the alto sax, Greg Abate was now also becoming a skilled "marketing expert." Fast forward to today and Greg Abate has indeed become a world-traveler in the service of his creative passion. When I asked what was one of the remotest gigs he'd ever played, Greg smiled and said, "Georgia. Not the state. The city. In Russia-- and then we went to Moscow for a week. It was winter and never got above zero. I played a couple of concert stages there and some jazz clubs." After three gigs here in Rhode Island, he'll be back on a plane again for a three-week tour of jazz clubs throughout Great Britain where he'll match up with 17 different trios he may or may not have ever met before. "I travel around 200 days a year, " Greg says, a hint of weariness crossing his face. Adding to his imposing to-do list, Greg also teaches Jazz Theory at Rhode Island College and continues to make and distribute CD's of his music. He now has 15 CDs on sale in stores and on-line. The title of his latest album is "Motif." One of the CD's he's proudest of is the one he made recently with his long-time idol, alto-player Phil Woods, a name well-known throughout the jazz world. "It was a special treat to get to play with the guy who's been so influential to me." I've known and enjoyed Greg Abate's music for many years. Ultimately, what I draw from it is the mixture of creative intensity, thoughtful lyricism, and the constant sense of searching for beauty-- despite the tasks, distractions and frustrations of just making a living in the modern day world.